I've never really had a proper skincare routine since I rarely ever break out, but that changed in November last year when my mother bought me some Simple products and I've slowly started to get myself in the habit. 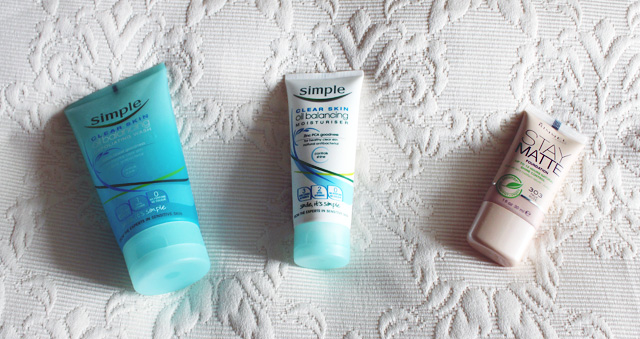 I really like Simple since their products have no fragrance; I'm really sensitive to scents and I'm glad I've found a line that I can use without getting a headache. I've always had combination skin - an oily T-zone and dry cheeks - and would normally have to powder my nose constantly throughout the day. So I got my act together and developed myself an oil balancing routine and I couldn't be happier with the results. First off, I wash my face every night with Simple's Clear Skin Oil Balancing Exfoliating Wash and my face feels amazing afterwards; clean but plump. When I'm slack and don't use it for awhile, I can really notice the difference and spots start popping up everywhere. To follow up, I use their Clear Skin Oil Balancing Moisturiser which has really reduced the shine on my face, especially my nose area. When it comes to makeup, I've switched my base from a tinted moisturiser to Rimmel's Stay Matte Foundation and have noticed a great deal of difference. I set it with Natio's Pressed Powder, but I don't have to reapply during the day which is fantastic. Not only does it reduce shine, it also has great coverage and makes my skin look much fresher. If you're looking for well priced, shine free skincare and beauty products, I definitely recommend these. I purchased these from Coles, but I'm sure any general beauty outlet will stock them. I'm a huge fan of the Simple range - the products are cheap and ACTUALLY get the job done. I love recommending them to teenage girls too, they always need products which clean without stripping, and Simple is the best I've come across!